IBC lets operators control the boom tip directly instead of controlling each independent boom joint movements manually. John Deere recently announced that Intelligent Boom Control (IBC) is now offered as an option on all 1110E Forwarders to increase forestry forwarder productivity and efficiency. This technology will significantly increase forwarder production while minimizing fuel expenses and maximizing boom lifetime. Intelligent Boom Control has been recognized for making the operator and equipment’s workload lighter and easier, as it operates the boom with more accuracy. The John Deere 1110 Forwarder was introduced to the market nearly 20 years ago and has since received much positive feedback from those involved in the forestry industry. The 1110E is designed to make operators’ work easier with 5500-mm load space and 183 horsepower, and now offers the IBC system for even more control. The IBC system allows operators to control the boom tip directly instead of having to control each of the independent boom joint movements manually. This helps boom operation becomes more precise, fast and easy. With the elimination of unnecessary movements, the system is able to increase durability of boom structures and hydraulic cylinders. While maximizing productivity and minimizing costs, these features will result in improved forestry forwarder operations. The Intelligent Boom Control system also accelerates the learning curve by incorporating easy to absorb and use technology. The technology will reduce the amount of time needed to become a skilled operator and cut back training hours. The John Deere 1110E Forwarder with the Intelligent Boom Control option is now available in North America. 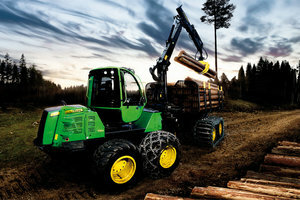 IBC is also offered as an option on all of John Deere's 1210E and 1510E Forwarders.